Called the "White City" thanks to the color of its World Heritage-listed architectural landmarks, Tel Aviv serves as Israel's modern and cosmopolitan second city. Kick off your visit on the 22nd (Wed): stop by Agas and Tamar, browse the eclectic array of goods at Jaffa Flea Market, then stroll through Tayelet, and finally browse the eclectic array of goods at Carmel Market (Shuk Ha'Carmel). To see where to stay, ratings, maps, and more tourist information, refer to the Tel Aviv trip planner. 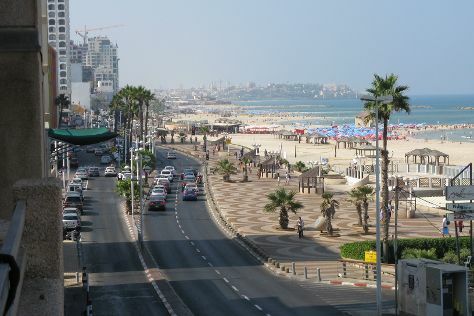 Jerusalem to Tel Aviv is an approximately 1-hour bus ride. You can also take a train. August in Tel Aviv sees daily highs of 36°C and lows of 30°C at night. Wrap up your sightseeing on the 22nd (Wed) early enough to take a bus back home.